“Google Posts” is finally available to all Google My Business listings. Posts allow you to share information when your listing appears in both Google search and Google maps results (Desktop, Mobile and Google Apps). Google announced the rollout on June 22nd here. 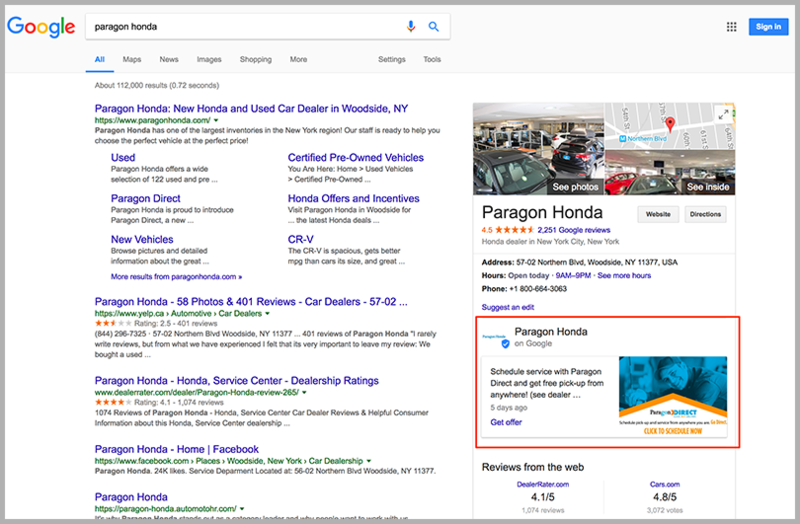 Google Posts allows you to share items like current vehicle incentives and drive traffic to your desired landing page to provide further details. You can showcase your dealership or current offers – the choice is yours. Go to your Google My Business account and clicks on “Posts” on the left-side menu. You can find complete help docs from Google here. This is how your Google Posts will appear when users Google your business (desktop example). Though these are fairly new, we do have some early numbers and suggestions. We analyzed 19 dealers covering 5 different OEMs in the month of July who had created at least 1 Google Post. Use the URL Builder to tag the url you use. This will allow you to see the traffic coming from the post in Google Analytics, and what happens after they click. Without doing so, you will be able to see stats when you view the post in Google My Business, but you will only see views and clicks, nothing more. Google Analytics and tagging will allow further analysis about what these visitors did after clicking your “post”. The “Learn More” Call-To-Action (CTA) has a higher click-through-rate (CTR) than “Get Offer” in our analysis. More stats further below. When you have multiple posts, the newest ones will show first; the older posts will show in a carousel format. We analyzed 66,796 views of Google Posts containing vehicle incentives/offers on dealer listings in July. The overall click-through-rate was 0.17%. Not great, but it’s early stages so far, that could be the norm. All the Posts were new vehicle incentives. When selecting a CTA, we found “Learn More” had a higher CTR than “Get Offer” based on the limited data we have. More experimenting is required, but keep those quick tips in mind when creating your new Google Posts. Awesome stuff. While CTRs are not huge at moment, this strikes us as an under-utilized tool. We’ll definitely experiment. One thing I saw was using it for service promotions. The majority of people who search for the dealership by name (when you’ll most likely see the post) would be service related queries, promotions for service and links to online booking would be a good comparative test.